This year’s Silicon Valley CodeCamp was a blast! Tons of motivated people, great weather, and interesting sessions. Here is a copy of my slides. 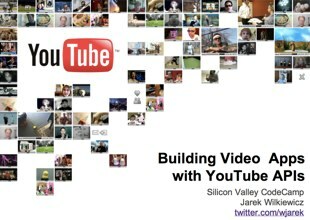 I was very happy to contribute and speak about YouTube APIs. Thanks! This entry was posted in conference, youtube and tagged codecamp, svcc on October 12, 2010 by jarek. This entry was posted in conference and tagged codecamp, svcc on October 9, 2010 by jarek.